I definitely try not to romanticize the wild west too much. I mean the toothaches, the tuberculosis, the scary surgical procedures. Yikes! But hey, I can totally appreciate the larger than life characters, the adventures, and having a trusty steed to get me where I’m going. On Saturday, January 27th 2018 I backed Western Legends on Kickstarter. This was the western sandbox board game I’d been waiting for! I received the game in September. Since then I’ve had a chance to catch several games with friends and I can say I truly enjoy this one. Pretty sure the typography was at least 40% of the reason I backed this one. Poker – The designers employ a very satisfying take on poker to resolve confrontations during the game. Reserve those high cards in hand for use in such conflicts OR play them to gain instant benefits and actions. Replayability – I dig games that give players ways to customize their experience. Lots to explore here, like shopping for gear and accomplishing story-based achievements which change the direction of the game. Immersion – Once the game is set up, you cannot help but feel surrounded by the experience. The art, the lore, and the sense of adventure is great. You can achieve points on the the Marshal Track or the Wanted Track. Do good, or ill. Your choice. Either way Legendary status is possible. Did I mention you can mine for gold in this game? Yup. There are tons of reviews online for Western Legends by folks who’ve analyzed the game’s many details. For me, I tend to focus on how I “feel” when playing games. To grow up in Arizona is to grow up somewhere where history happened. There are so many stories of legends who lived and died here. There are stories about unknown legends too. And probably so many mysteries and secrets the desert will never reveal. But playing this game feels like being there, even if for just 60-90 minutes. Without the fear of tuberculosis. What about you? What game(s) have you been playing lately? 2018 marks the 10th anniversary of Phoenix Design Week. It’s a big milestone for this homegrown event and it was one of the best I’ve attended. For those who may not know, PhxDW gives local and visiting creative professionals a chance to connect, learn, and inspire each other during a week of programming specifically tailored for their career growth. Had the privilege of presenting at this year’s Phoenix Design Week – Beyond Design Conference. Sure, the event is called Phoenix Design Week, but over the years I’ve connected with creative professionals from all disciplines – photographers, illustrators, animators, etc. This week-long celebration of creativity kicks off with a two-day conference, which was named “Beyond Design” this year. Design is about planning, purpose, and intent. No matter if it’s applied visually or technically or whatever. Anyone can learn principles of design. However, being a creative professional is about more than possessing knowledge. It’s about successfully applying one’s knowledge and creative process in a business setting – for yourself, clients, or employers. That’s a completely different level of one’s design journey. Over the course of 10 years attending PhxDW, I’ve met a wide variety of people from different businesses settings. Printers, marketers, engineers, architects, developers, and others. I can truly say each of these connections has taught me something about how to stay relevant and marketable as a creative. Ramen Doodles = Gave a drawing presentation this year. It was a great time, packed the room and ran out of stickers! Showed off some process tips and tricks using digital drawing. Opened up about time savings and using digital drawing on the job. Hey, look at this banner! Ok, that’s it. Just in case you’ve been on the fence about investing time and money in this event, or even if you’ve been skeptical about it’s value, I captured 50 reasons to go in 2019. All the good vibes at the opening reception! Saying hi to one person can lead to new career opportunities. Listening to how others get work done helps us keep going. It’s not a popularity contest, it’s an investment in yourself. Broadening our perspective on the world helps us be more relevant as creatives. Laughing with others is good for the soul! Seeing someone who’s ok being vulnerable during their presentation reminds us we’re all human. Having lunch with others who love creativity (and ramen!). If you’re nervous about meeting people let me know, I can help. It’s an affordable local event. Adobe Max = way more investment ($1600). Sharing your career story with people who will actually listen. Browse pop up shops. Learn from their owners. Exhibit your own pop up shop. Learn more about the job market in Phoenix and trends abroad. Gain practical advice on being a better independent contractor. A welcoming and helpful AIGA AZ team. Choose breakout sessions that are right for you. 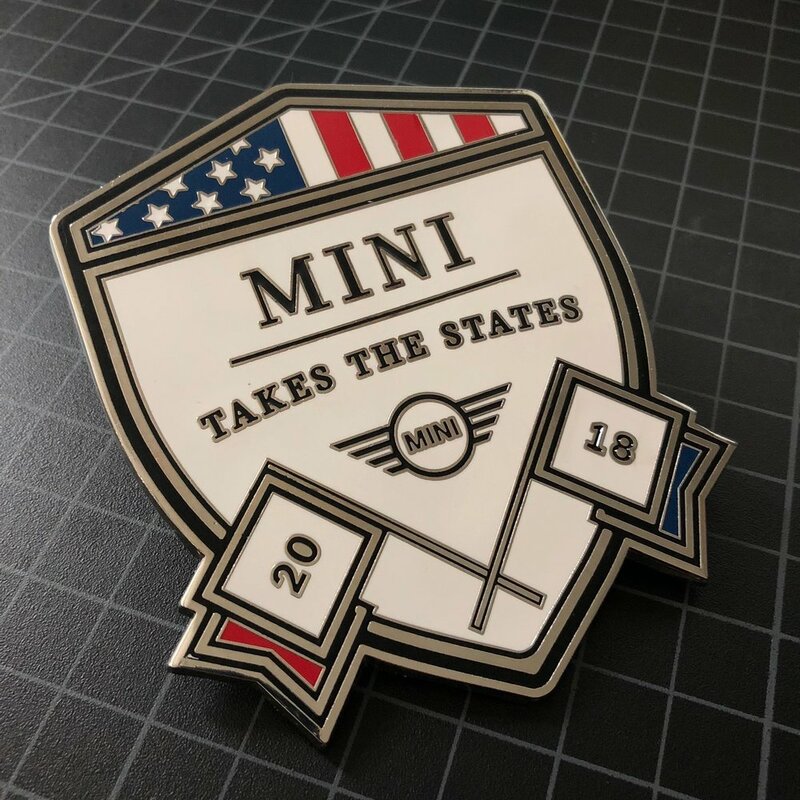 Meet designers from other states you may be looking to visit. 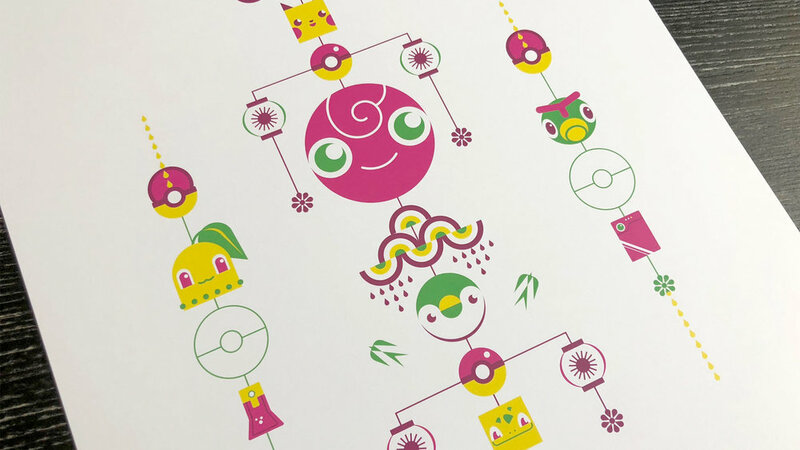 Shoot the breeze with local acclaimed printmaker Jon Arvizu. Talking about tabletop game design and it’s relationship to other design disciplines. Getting that feeling when you know what to do next in your career. Saying hi to Melissa Balkon and learning about her creative journey. Wearing your favorite hat, or shoes, or pop-culture bling, and getting a nice compliment. Smiling because you identify with what that speaker is saying. Expressing yourself in a safe environment. Getting the chance to tell someone how they’ve helped you in your career. Talking with Will Mejia about being a mixologist on the side. Learning about how you can help others in your community as a creative. Getting involved as a mentor or being mentored by someone. Hearing hip historian Marshall Shore talk about how amazing the AZ desert is. Gaining a deeper understanding of UI/UX personas and empathy maps. Talking biomimicry with ASU professor Michelle Fehler and realizing how much nature inspires our creativity. Walking into the convention center with a sense of optimism. Hugging that design friend you’re reconnecting with. Discovering a new opportunity within your skillset. Listening to someone open up about their challenges. Understanding more about the business of illustration. Asking a burning question. Getting an answer that changes everything. Demonstrating your value and potential to your employer. Taking notes/pics and using them in a presentation to your team back at the day job = hero level initiative. Growing a strong local network. Closing party with the National Poster Retrospectus. I have more reasons, but you know… overkill! Hey, not every year has been the greatest ever in terms of practical takeaways. Yes, some years have been more theory and less hands-on. But when I look at the investment I’ve made versus what I’ve gained, the value is exceptional. 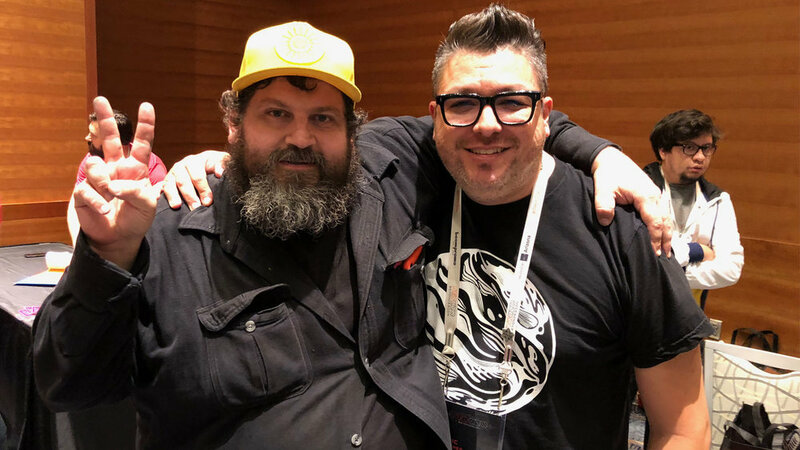 Portland’s Aaron Draplin. All around good guy. (A heavy paw keeping me on the ground there.) Also, our design friend Kevin Varela = photobombin’ with style! Sounds obvious. “You do you”. It’s easy right? Right? Nope. We’re living in some sort of dark wonderland these days people. Lies are truth, truth is lies, right is wrong, and everything seems inside out some days. It can be very disheartening. That’s why we need events like PhxDW. It’s one way we remind ourselves that we’re more than just eyeballs staring at screens and mobile devices. We’re more than consumer drones. We’re more than stats on a graph. We’re people. And we need to come together to help each other keep growing and keep going despite challenges. Whether that’s in life, in business, or creativity. That’s how Phoenix Design Week helps me. I’ve been involved with PhxDW for years, but it’s not cause I have some magical energy or special skill. Presenting as a speaker, on panels, or in workshops – it’s all been out of my comfort zone. But I’m not out to prove anything to others anymore. All that remains is what I want to prove to myself. And I do this with the support of a thriving local creative community here in Phoenix. That’s not just liberating. It’s freedom to fly. Released a new art print series this year at PhxDW! 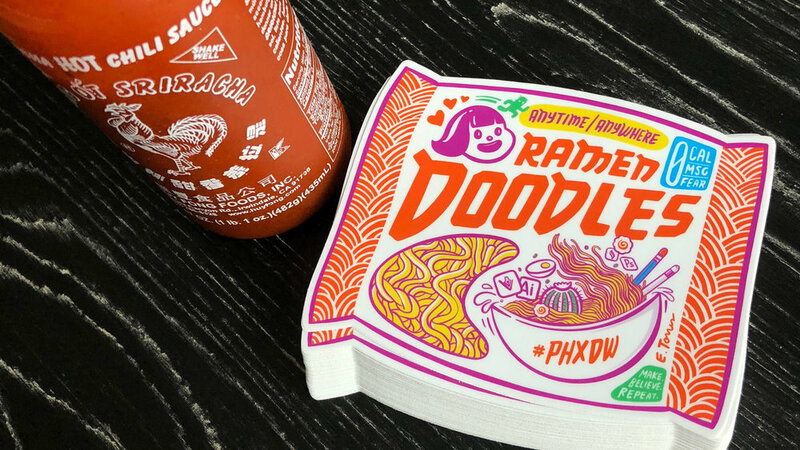 So, do you have a Phoenix Design Week story or takeaway from this year? Share it below. You never know how your thoughts might help someone else. It struck me the other day: if my memory is degrading as I get older, maybe I'm already losing who I used to be. Maybe I'm already starting to misremember my experiences in school, or how people I love have treated each other, or why I've done the things I've done in my life. It's a scary thought. Do you ever think about this? I mean, all these roads we travel – relationships, careers, hobbies, etc. – lead back to our memories right? And if we know our brains are all at once amazing and subject to faults as well, can we trust our memories to remain "real" over time? The way I want to look at this is: all I remember is somehow marked "important" in my brain. My first kiss. Graduation day. The way my wife looked on our wedding day. The day our son was born. I imagine all these things will be among the longest lasting memories I keep. I hope. As we encounter the road hogs, bad bosses, family struggles, false friends, and basically anything short of serious trauma, let's keep these things out of the "important" category. Chances are, those things won't matter tomorrow. Being happy internally is in sharp contrast to appearing to be happy. Being happy internally implies there is work going on. It means one is desirous of contentment. Contentment is hard to measure in smiles and superficial words. Here's why I say this. It could be argued that all emotions are valid, even if they're not always constructive. We're human. But the act of creation, on any small or large scale, is evidence of a person's measure of happiness. The cynical, bitter, and angry person does not find satisfaction in creating. Nor do those who merely see making things as a way to get money. It's one's creative spark or inner well-spring of creative energy which powers the act of bringing good, or beauty, or meaning into our world. The modern day creative entrepreneur or professional entertains a wide range of emotions related to the act of creation. Fear – Am I ready to take on this project? Anxiety – Will my creations be good enough? Doubt – I'm not sure I have the credibility to do this. There are other factors such as comparing ourselves to others, dealing with our life realities, and accepting personal limitations. Consequently, there are times when the creative may appear to be anxious or troubled due to adversity, but on the inside he or she is working hard. This is why I say happiness is less of an outward expression and more of an inner quality of being. Sure, most of us like to smile and laugh. But these expressions are not proof of a person's happiness. Happiness is a commitment to how one copes with challenges, perceives social injustices, and bends to the pressures of everyday life. It's a mindset. In the end, the effort to cultivate happiness is an investment towards an individual's road to contentment. For instance, I see each project I finish is an intentionally placed stone on that road. And, if I live to be an old man, what waits at the end of this road is something more than happiness. It'll be satisfaction, purpose, and meaning. In short, if we view our happiness as largely a result of what we do with our time, rather than what happens to us or what we get in life, I have to believe contentment awaits.